As a quality focused roaster, we strive to adhere to these core ideals as they are the fundamental building blocks to a great coffee experience. Some of these items are much less complicated than you may think. Fresh crop can be either a date off harvest or it can be about packaging the the unroasted coffee better than the traditional jute bags of old. Protecting the coffee in Grainpro or vacuum sealing it in some cases can preserve the life of a coffee substantially. Packaging can protect the coffee from cross contamination, prevent rapid aging, humidity contamination, and many other issues that may affect flavor. What temperature unroasted coffees are stored at can also play a role in how a coffee ages and how fresh it is. A warehouse in the summer heat and humidity of the deep south will fare much worse than a temperature controlled (cool) and dry storage site. We take pride in fresh roast being the only area roaster to place our roast dates so prominently on the front of every bag. We feel like the roast date is a badge of quality. Where other roasters may hide their roast dates or place arbitrary best by dates months out to make inventory easier to sell, we know many coffee connoisseurs value knowing when it was roasted and we aim to serve them. Fresh ground is the one where we often get into a tricky situation. We are the only roaster in the area that sells wholesale but doesn't ship preground coffee to accounts or retail consumers. For many reasons beyond the obvious staling of preground coffee, we made it a policy not to grind. We do lose some wholesale clients on this, namely many restaurants, but feel it's essential. We feel it can be a serious disconnect to expect a wholesale/retail customer to pay for premium coffees and then brew/serve a less than premium cup. We also have a policy in store not to grind bags for customers (and don't have a bulk grinder for this) based on the same idea. Fresh is better, but paying $18/12oz bag of preground coffee that obviously won't taste like an $18/12oz bag of coffee should if ground fresh probably isn't a good value. Fresh brewed is the easy one that everyone gets. Brewing fresh is the final aspect full of caveats and variant methods. We like to offer and suggest per cup or on demand brewing as much as possible because it makes a difference. The coffee always just tastes better when brewed in smaller and fresher batches, what's smaller and fresher than a cup at a time? We have many brew guides on the blog and even some helpful bits of barista info in shop you can pick up when you drop by, so don't hesitate to ask. We might also be the only roaster in the area with an all per cup bar as well but the biggest contrast is definitely the preground issue. The reasons laid out are why it isn't an option on our online site nor in store, we hope you understand and look forward to your continued support. For several months, we have been discussing and planning a roaster modification that was a little tricky to predict. After a lot of discussions and then a few tests, we have moved into the production phase of testing. The modification was a simple addition of a baffle to direct convection of hot air and thereby increase efficiency on the outside of the roasting drum. Size, placement, and material were something we spent a lot for time on beforehand. We currently have them installed on both roasters. Initial results have been noticeable increases in aromas and clarity. 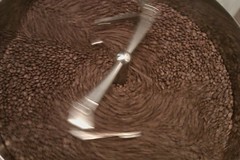 All roasts from the 21st on have this modification and you will notice a positive difference in your favorite coffees. Special thanks to Luminarecoffee's Andrew Coates for help in the design and installation. New limited run espresso: Reanimator and Linnaean St. The current espresso project is a lively and juicy shot with very interesting aromatics. This lighter brighter espresso is an impressive match of three very different coffees. It's made up of Guatemala El Bosque, Colombia Matambo, and Colombia San Sebastian. Sebastian is the base with an extremely clean and sweet profile topped with a light pear aroma. Bosque and Nazareth intermingle adding both a deep berry punch to the cup but also a strong aromatic citrus component. The other current project is the return of Linnaean St. espresso blend. It's a classic in our lineup that many of our early supporters still talk about. We are even going to do a bit of a throwback label to do it justice. This blend is light, bright, and aromatic. 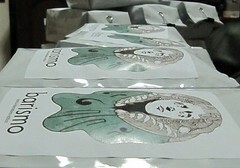 When rested properly, the pairing of Kenya Othaya, Guatemala El Bosque, and Colombia San Sebastian are very expressive. Much like the old 'L Street' blend, this has very nice aromatics and goes for a fruit punch feel. Given that Simon's (which is coming up on 10 years as a cafe) was the inspiration for this blend, it's also going to double as a celebration blend of sorts. We are offering both on the website as a package until Christmas. "At the very top of this 20 acre farm, about two acres of Maragogype varietal was accidentally planted five or six years ago. The seedstock for this varietal came from the nearby UH-CTAHR extension station, which maintains a varietal collection. Somehow when the pickers were collecting seed for planting, they wandered onto some trees of Maragogype." "Our friend Miguel Meza cupped a mixed harvest lot last year and while a little faded and un-ripe picked, saw a lot of potential. Miguel had the farm do a test batch of natural for the last picking in 2010. Beginning with the new crop in October, he had them keep the harvests separate. The cup possesed a very unique peach-apricot flavor and had very heavy mouthfeel. The next three big harvests, (November, December, and February), the picking was much riper and the cup pretty fantastic." "Through Miguel Meza who served as a production consultant we were able to secure this meticulously processed and well-grown coffee. This is the prefect example of a coffee that under the right conditions does not have to be at a high growing elevation to produce an excellent cup. 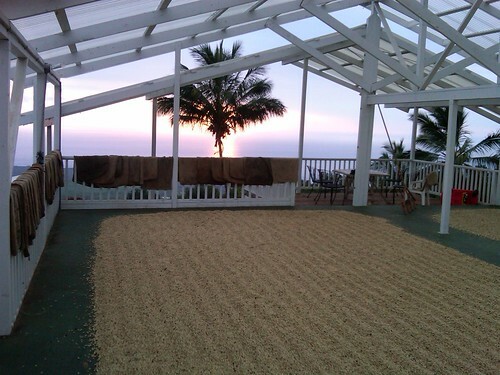 We appreciate the hard work of our partners and are proud to share with you some of the best coffee to ever come out of Hawaii." We have very few constants in our espresso lineup as we switch components based on what's seasonably available. The one profile that hangs around is the Clockwork espresso. This will be a blend of coffees for a consistent profile even as the components may change seasonally. Look at the component list and percentage ratio for each change and there is also a subtle version number on each label for major changes. We based the original artwork for that espresso on Clockwork before the Clock. Soon to return will be our Soma espresso which uses our most expressive coffees for a stellar and uniquely balanced but still complex espresso. The Soma has been a standard of our lineup for a long time and it's been missed. Aside from those two concept espresso, we have the ever changing 'Wabi Sabi' series. These change constantly and are often special experiences of coffees paired for unique flavors. With the Wabi espresso, it's about changing it up and offering a new look as different estate combinations become available. 'What if you took a wine approach to blending? Two or three high grade varietals blended together for something even more complex. 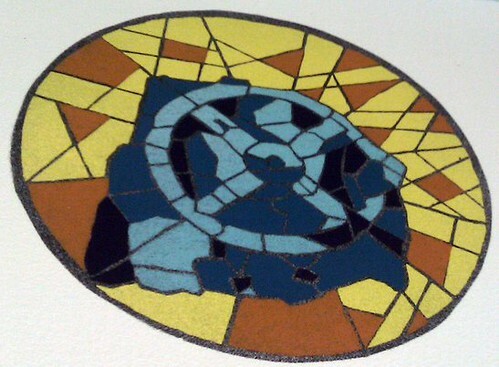 Instead of putting together inferior parts, use components that were great as separate pieces.' From a 2006 barismo blog excerpt. Ingredients are where quality starts. What goes into an espresso is the preface to quality of roast, freshness of brew, or all of that fancy gear. Knowing what components build an espresso is the most powerful variable in that it develops a sense of awareness for your own personal preferences to the specific ingredients. Knowing what you like and do not like is easier when the components are listed on the bags. 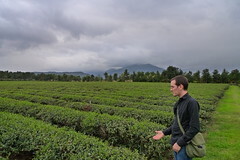 Having a sense of what those farms or origins taste like together retains some identity of the unique components. Identity is important for farms when leveraging better prices paid for coffees. Historically, roasters have created espresso blends by mixing in agey or past crop coffees, lower grade coffees, and softer or low grown coffees. Knowing the contents is a powerful instrument in judging the value of an espresso. Some roasters are reluctant to give up prized recipes for their espresso blends, but the more progressive roasters should be proud of their components and those unique ingredients. Our interim barista, Tyler Ferris, gives a simple overview of the manual brew methods that we offer in-shop at barismo. Tyler will be at dwelltime in Cambridge once it opens up. Many of our customers are familiar with our offerings at barismo. However, a large number of people that stop in and visit us have never seen such a thorough per-cup drip program in action. We seem to answer this question quite a bit: could you tell me about your manual brew options? It was great for us to write the script for this video, it has even helped some of our newer staff to better articulate our per-cup program. We were able to break down our three manual drip methods to give you an idea of why we use each method and perhaps peak your curiosity about ones you have not tried out yet. To read a bit more on filters and depth filtration check out some earlier posts by Jaime that our readers have found useful. Feel free to stop by 169 Mass Ave in Arlington and we can offer recommendations about which coffees like to use for the different methods or answer any other questions you have about our per-cup options.